Jack Kerouac is in The Luna Theater. It’s tough to spot him right away, above the shoulder-to-shoulder crowd of pierced and tattooed 20-somethings grooving to a live rock band. But Jack is there, a dark figure large and sprawling, vibrant and loud, staring out at the audience from a canvas of turquoise, magenta, orange and yellow. Staring back is Markus Sebastiano. 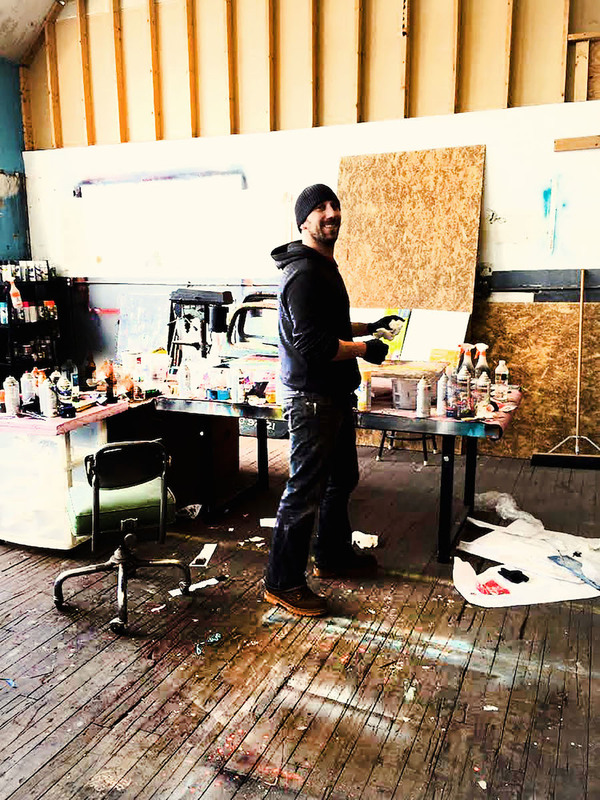 The artist paints in the moment, surrounded by magazine scraps, cans of spraypaint, and a chest-thumping bass beat. His work has been tapped by the Frame 301 gallery of Montserrat College, the trendy Gallows restaurant in Boston’s South End and, earlier this year, the Museum of Fine Arts’ annual summer art party. Not bad for a kid who, in the beginning, was rejected from art school. But he loved design and had a head for business. By the time he was 21, the Lawrence native owned an apparel company called 8 and 9, which is still alive and kicking today in Miami. Sebastiano immersed himself in the professional world of marketing, branding and advertising, while his passion for translating ideas to canvas was placed on a back burner. When his second apparel company tanked, he set his focus on the large-scale art pieces he often dreamed of building. He found inspiration in old photographs, forgotten books and weathered relics of iron and wood that time seemed to abandon. “I grew up in my dad’s metal shop (Comeau Sheet Metal in Haverhill),” he says. “Both my father and my grandfather were old-school, hands-on guys who could fix anything. I look at the products of the past and how they were built slower, with love and concentration. Objects forged by hand were built to last. I took that know-how — learning math, how to measure, design, mold, shape, cut and build — and went in the direction of art. His first piece was a large Buddha, sculpted from reclaimed pine, cold rolled steel, acrylic, spraypaint, and embellished with a blowtorch. The reaction he received was positive and the piece sold fast. 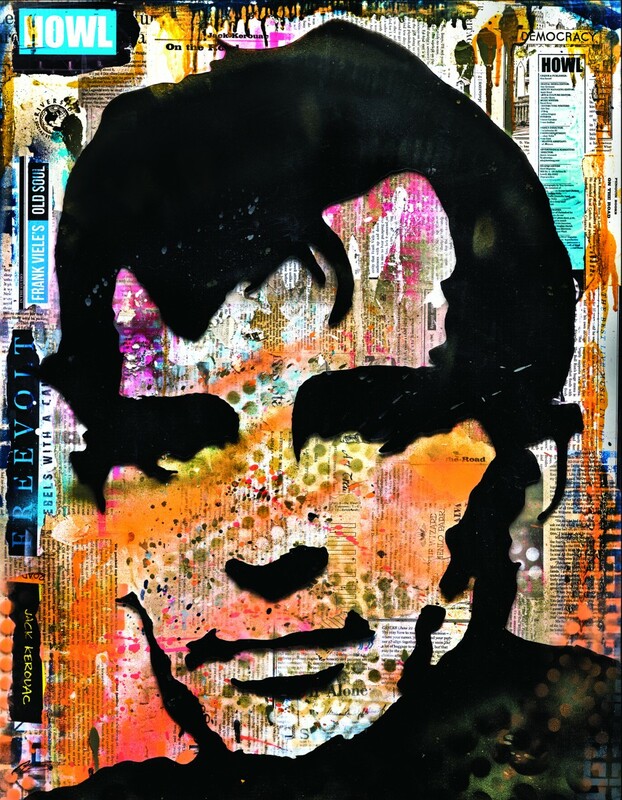 Texture and layering dominate his style, which he describes as “modern vintage,” and, as evident in pieces like “Hottest Love” (acrylic and spray paint over recycled French magazine paper and raised stencil scrap letters), feel dark and quirky, poppy and melodic. 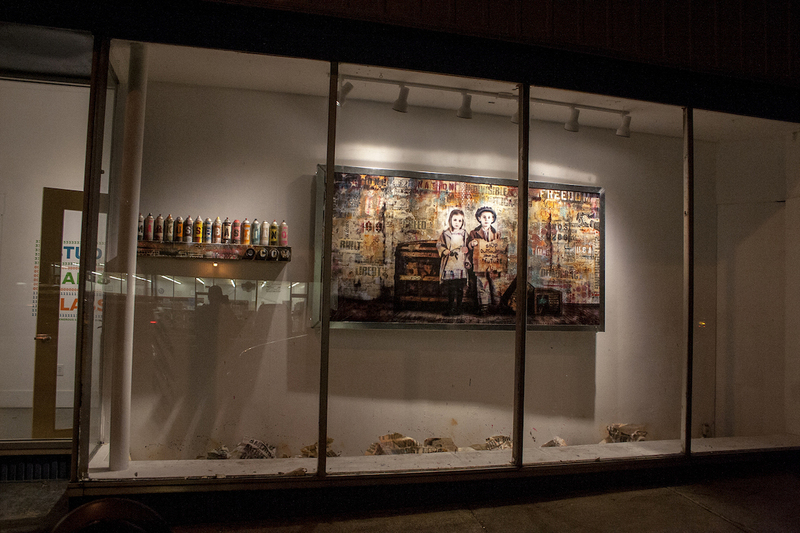 Just look at his behemoth storefront window installation for the Montserrat gallery, a project he completed live in a 3-foot-deep space that began with a simple stylized photograph of two children and evolved into a layering process using paints, old newspaper, books and magazine clippings and plexi-glass. The kids, dressed in early 1900s garb, hold up a sign that reads: Stop outsourcing your our future. His preferred method is freestyle, letting the colors and materials take him where they may. While he mostly works in his 3,000-square-foot warehouse space in Lawrence, he paints in front of a live audience as often as he can. Even though he was initially turned down from art school, he eventually received a Bachelor of Fine Arts with a concentration in graphic design from UMass Lowell.